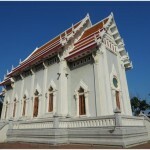 Wat Cholpratan Rangsalit is located at 1 Tiwanon Road, Tambon Bang Talad, Amphoe Pak-kred, Nonthaburi province, Phra Phrommangalacharn Panyanunthapikkhu is formerly the abbot. 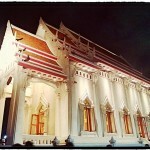 Wat Cholpratan Rangsalitwas builtin 1959 when M.L. Chuchat Khamphu was Director General of Royal Irrigation department who visited Wat Umong in Chiangmai province and he had listened Phra Panyanunthapikkhu’s sermon,he was faithful in new style of Dharma teaching from sitting on sermon seat to standing to give Dharma speech by verbal in front of general public as well as using reasonable, up-to-date and timely examples which can attract most people to rely on Dharma. 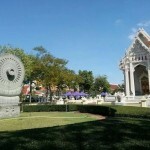 The Royal Irrigation Department constructed new temple called Wat Cholpratan Rangsalit atTiwanon Road, Tambon Bang Talad, Amphoe Pak-kred, Nonthaburi province and invited Phra Panyanunthapikkhuto is the abbot in 1960. Wat Cholpratan Rangsalitis currently peaceful and shady for the entire area of the temple which has religious activity every Sunday morning from 9.00 a.m. by praying, making Dharma speech and offering lunch to monks in Curved Stone Ground. 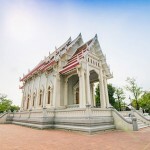 – By car, the temple is located at Tambon Bang Talad beside Nonthaburi – Pak-kred Intersection, if you start from Laksi when you arrive at Pak-kred Intersection, turn left and driving straight for 600-800meters and there is a sign board in your left.